Earthworms play a major role in the conversion of organic matter into humus, thus improving soil fertility in many soils. 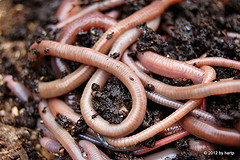 In addition to dead organic matter, the earthworm also ingests any other small soil particles which make minerals and plant nutrients accessible for plants to use. The earthworm's burrowing creates a multitude of channels through the soil and is of great value in maintaining the soil structure, enabling processes of aeration and drainage. Therefore earthworms are ecosystems engineers which have an important role for forest ecosystems. (3) anecic worms that construct permanent deep burrows through which they visit the surface to obtain plant material for food, such as leaves. As the diversity of tree communities can affect the structure and composition of belowground communities, also the decomposer communities can be influenced by tree species mixture. This will in turn influence nutrient turnover rates and lead to improved or reduced productivity rates. In a study in 25 representative forest stands in Flanders, Belgium, it was found that the dominant tree species is more important in determining the biological and chemical fertility of the stand than the soil texture and the climate. A global strategy integrating choice of tree species, rectifying nutrient inputs (liming, fertilizing) and earthworm introduction must be worked out to rehabilitate degraded loamy soils.